Our Regiment was equipped with the Russian made 130 mm M46 Guns when I was commissioned to the Regiment in 1982. 130 mm Gun was manufactured in erstwhile Soviet Union in 1950 and entered service with the Indian Army in 1965. The gun boasts of having achieved longest range of 27.5 km with conventional munitions. It traces its origin back to its predecessors used in ships and coastal defence by Russians during World War II. The gun was in the equipment list of many countries and some even produced their variants. The gun saw action during many conflicts across the globe – from Vietnam War to the recent civil war in Syria and Iraq. To be fair to the Russians, it must be said that indeed the gun was good and extensively used in the 1965 and 1971 Indo-Pak Wars. The problem however was with the accessories that came with the gun. When Indian Army procured the 130 mm Guns, a plethora of accessories were supplied by the Russians. Most appeared to be tried, tested and failed – hence the Russians wanted to somehow palm them off to others. India must have paid a hefty sum for these accessories. Most of them found their due place in the technical stores of the regiments, and hardly ever used. The biggest of them was the PPL Periscope – the wooden box for storage of the periscope looked more like a coffin. The periscope must have had its origin from the gun being used as a Naval Gun. Thankfully, no one in the regiment appeared to have even unpacked them or set them up for training or operations. No Observation Officer would have bothered to carry it to war as it needed at least six men to lift. On a ship, the carriage problem would not have been there and a need for a high periscope to observe the horizon was the requirement for any Observation Officer deployed on a ship in the high-seas. The next biggest was the Range Finder DS1. From its looks and make, it also appeared to have its origin from the days of the gun being used in its naval version. 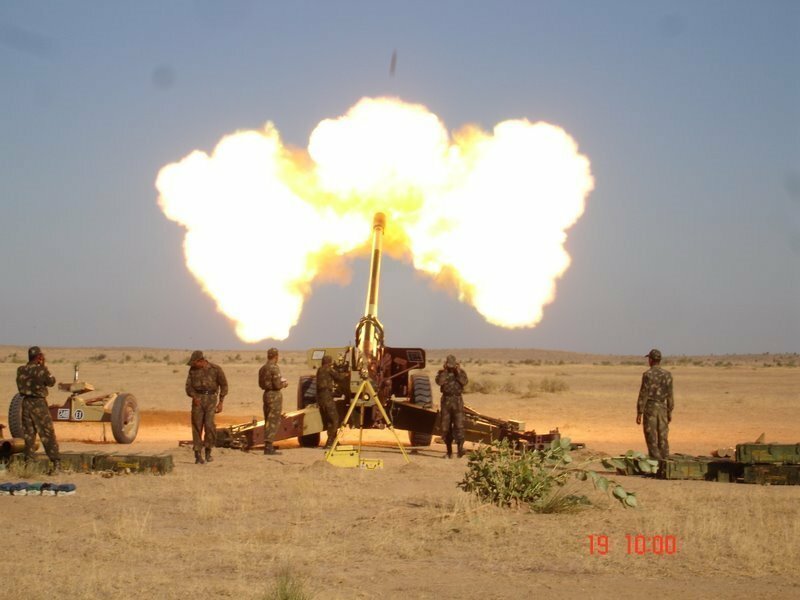 It seems that someone in the Indian Artillery hierarchy of the 60s took a liking for this cumbersome piece that a chapter for observing and engaging targets with this monster was incorporated in the Gunnery Technical Hand Book (fortunately it has been removed from the recent editions). The technique of employment was that the observation post officer measured the distance to the spot where a round fell and ordered the required correction in terms of ‘ Left/Right or Add/Drop’, having already made a similar measurement to the target, to make the round hit the target. For measuring the distance with the DS1, one needs to manipulate a knob and make five ‘diamonds’ that appeared on the viewfinder so as to position the center one on the object to which distance is to be measured and two each equidistant in front and behind it. This needed a high degree of practice and skill. Whenever I tried to operate the DS1, I could either see the object or the diamonds and never both, however hard I tried. I requested our Technical Section Commander – Subedar Bidappa – for help and he excused himself from the task owing to his poor vision. He suggested Havildar (Sergeant) Nahar Singh of the Survey Section as he had undergone a four-week long course at School of Artillery in operating the Range Finder. Havildar Nahar Singh agreed to transfer some of his skills and the art of manipulating the diamonds. On the set day, I got the Range Finder set up at the training area next to the Survey Section and Havildar Nahar Singh commenced his lessons. We got struck at the stage where the elusive diamonds are to be manipulated – as usual I could either see the diamonds or the object and not both. Havildar Nahar Singh demonstrated his skill with the range Finder and measured distances to many objects around the training area. He read out the distances nearest to a meter and to verify it, he read the distance to a telephone pole to be 376 meters and asked me to pace it. Great! it was indeed about 375 meters. I felt very small about my inability and kept trying to catch the elusive diamonds. Now came a warning from Havildar Nahar Singh – in case one operates the DS1 for a long period, one’s eyesight will deteriorate. He padded his comment with a line that soldiers operating the DS1 in the earlier days were authorised an extra egg in their rations to compensate for the struggle their eyes went through. Never to accept a failure in front of the soldiers, I tried with all my efforts to catch the elusive diamonds for the next two hours despite Havildar Nahar Singh’s warning. Seeing my resolve Havildar Nahar Singh must have felt bad and he came to me and requested me to pack up the DS1. He now gave me his piece of wisdom. He said that he too had never seen the elusive diamonds ever in his life. How the hell on earth did he measure the distances to various objects so accurately? He disclosed the secret that in the training area he knew the distance to all the visible objects as he had been conducting training for his section there. Whenever he measured the range to an object, he would focus the Range Finder on the object and set the distance on the scale. How did he manage it during the training at the School of Artillery? There too all the students carried a small notebook with the accurate distances to various objects from various training areas. He claimed that hardly any student ever caught the glimpse of the elusive diamonds. Guruji and Bhagawan (God) Shoot follows. Out of box ,selection of the topic, gives out a refresher course in gunnery! Had almost forgotten about DS 1. Smart guy. He had the greens with him always. This is only a tip of the iceberg. We are successful, as our neighbors are 100 time worst in defense spending. Globally, Mr Percentage decides most of the things in Defense. So why expect more from the suppliers. Play the game as it was in the past. Glad to know there were more gunners like me who could not use RF DS1 effectively. But the gun was damn good for the period, especially for its range of 27490 M, ruggedness and the accuracy.